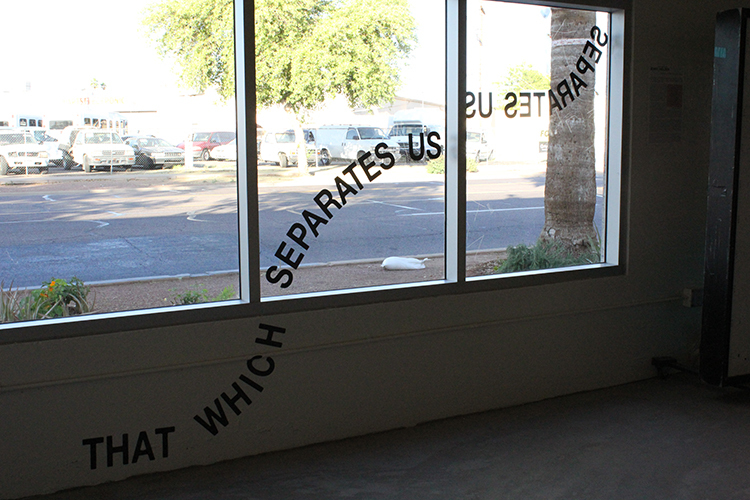 Installed on the interior and exterior of the Frontal Lobe gallery space, Kristin Bauer’s text piece That Which puts into question the trivial differences we use to separate ideologies from one another. Having grown up surrounded by the influence of Christian religion and the repetition of Biblical phrases, Bauer focuses on the statement “That which separates us”. Although initially this statement is intended to generally imply the separations between god and humanity, she utilizes this statement instead as one that divides ideologies and the people who believe in them. By viewing the piece indoors or outdoors, the artist utilizes the most transparent and also most vulnerable part of the building to confront the viewer with their perception of safety and division. A simple break of the glass would shatter the interior from the exterior. 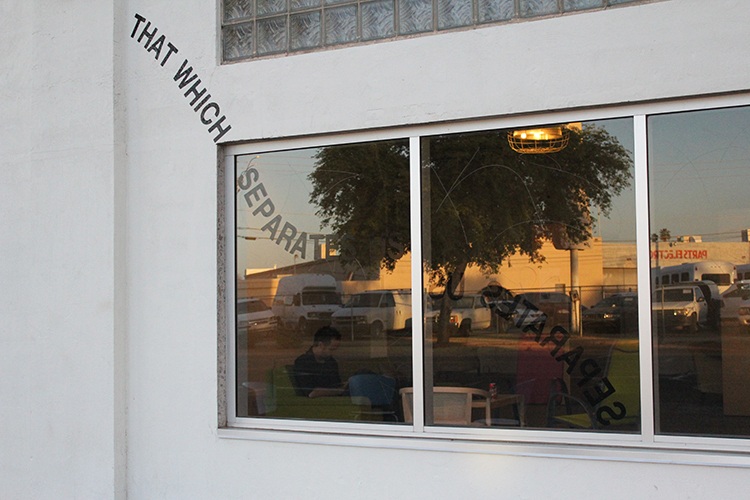 While we might imagine that a sheet of glass provides a barrier and safety from the unpredictable events that take place “out there”, the text itself suggests that we complete the sentence with what we feel is dividing us or, conversely, bringing us closer. By extricating the words from their origin, Bauer attempts to strip them of their religious reference and instead asks us to look plainly and cleanly at the significance of the half sentence. Unlike artist Jenny Holzer, who utilizes text to reveal the more sinister intent or implications of its content, Bauer instead re-situates her selected statements to convert it into something that takes on new meaning given the space it is in. The words respond to the architecture of the space, the fear and apprehension of the viewers, and the different perspectives a person might bring to the statement. The work becomes confrontational and welcoming at the same time—existing right on the edge of welcoming or rejecting the Other.